Life is Too Short TO Not Live Life to the Fullest! Go Fishing! Make your Pets happy ! Super plump, healthy Wax Worms for feeding reptiles, birds, and for bait. You will be pleased with our wax worms. The wax worms pictured are in a 250 count cup. If you purchase 1000 you will get four cups of 250. Great for bait and for fattening reptiles. We've caught some pretty good Pan Fish with these. They are also a must for ice fishing. Great for adding variety to reptile diets, feeding small animals, or for fishing. You'll catch a ton of fish with our plump, clean worms! 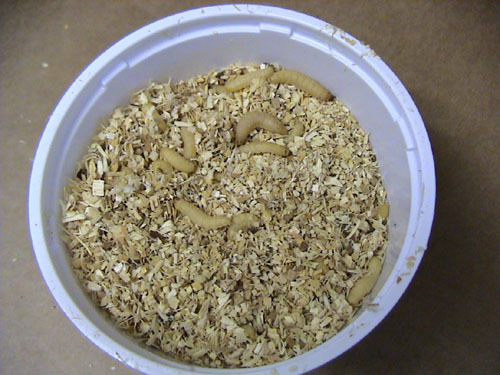 Check out our forum and blog as well as our pages on Wormman.com to learn to grow wax worms. We also have many videos on Youtube.com. Check out this wax worm bedding/food video that will show you how to make wax worm bedding so that your wax worms will get big and plump. 250 Wax Worms: $19.50 Free Shipping! 500 Wax Worms: $30.04 Free Shipping! 1000 Wax Worms: $50.83 Free Shipping!